At the "Tourism Recreation Farm", fully home colored with deep green and clean air, we provide the experience of digging potato. 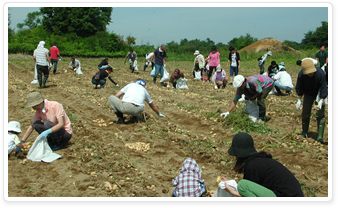 It seems like the “treasure hunt” to work digging out the delicious May Queen potato from the fertile ground of Atsuma. Joy when big potatoes came out is exceptional!! Outdoor BBQ lunch with one of our speciality products, “Azuma Jingisukan” is also available upon your requests. A lot of groups have enjoyed this program every year. Please use for colleagues’ and family leisure. ※20 people per 1 are is the best suit for Potato Digging. ※Please consider to have more than 20 people per 1 are when you book. ※If you would like have drinks or the sale of vegetables other than potatoes, please inform us at the time of booking. ※You can purchase bags for potato at \35 per bag if you would like. 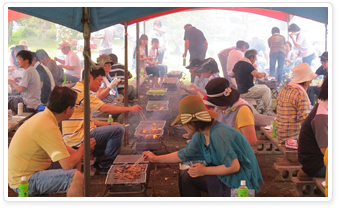 ※With grilled outdoors, can accommodate up to 45 people. please take all Garbage to your home, or we will dispose them for you with the fee of \30 per parson. ★ A small shovel and rake are very useful for digging. It would be even better with a hoe. ★ Need rubber and work gloves, and boots. ★ Because the parking lot is limited, please make use of the chartered bus or share your car with your friends and family. 1. You can play with balls and enjoy free Park Golf when you bring your own equipments. 2. Due to the regulations of park management, please bring garbage bags and take garbage to home after meals.